Top Republicans in the US state of Texas have unveiled a bill that would ban transgender people from using the toilet of their choice. The Texas Privacy Act follows similar legislation in North Carolina that sparked protests and business boycotts. The Texas bill would force transgender people to use toilets in schools and other public buildings according to the gender on their birth certificate. "It's the right thing to do," said Lt Gov Dan Patrick as he set out the plan. "The people of Texas elected us to stand up for common sense, common decency and public safety." Public bathrooms have become a flashpoint in the battle over transgender rights in the US. 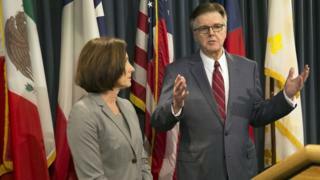 Like other conservative Republicans, Lt Gov Dan Patrick, who holds the second highest position in Texas government, has argued that the bill in necessary to protect women from being attacked by men in public toilets. But that argument has been rejected by opponents, who say legislation should be used instead to target sexual predators. North Carolina's law, which went into effect last year, caused companies, entertainers and sporting events to pull out of the state, potentially causing it to lose billions in revenue. Despite that fallout, lawmakers in at least two other states, Virginia and Kentucky, have also introduced similar bills. As politicians introduced the Texas Privacy Act, or Senate Bill 6 (SB6), on Thursday, loud boos and chants could be heard from nearby protesters. A major industry group, the Texas Association of Business, said the legislation could cause the state to lose up to $8.5bn (£6.9bn). However, many conservatives in the Republican-controlled Texas government are still expected to embrace the so-called "bathroom bill", according to the Associated Press news agency. Lt Gov Patrick said the legislation would "protect businesses from government interference" by overturning existing local laws that protect the rights of transgender people to use the toilet of their choice. Republican Sen Lois Kolkhorst, who is sponsoring the bill, insisted it would not require "bathroom police", but that citizens would be able to file legal complaints against local authorities if they did not conform. The American Civil Liberties Union of Texas and other rights groups condemned the move. "It's unnecessary, discriminatory and inconsistent with the constitutional value of equal protection for all,'' the ACLU's legal and policy director, Rebecca L Robertson, said in a statement. "Make no mistake, the invidious intent of SB6 is to deny transgender Texans the ability to participate in public life." In May, the Obama administration issued a directive ordering public schools to allow transgender students to use toilets that correspond to their gender identity. The president's announcement prompted 12 states to announce they would sue the federal government over the directive, including in Texas, Alabama and Wisconsin. In August, a Texas judge approved a temporary injunction suspending that directive.